You will likely have questions about the impact the removal of a tooth may have on your future dental health and on your lifestyle. Dr Henry will discuss all of your concerns and give you the required information you need to make an informed choice. By providing you with all details, you can then decide if an extraction is the right treatment for you. Wisdom teeth are the last teeth to emerge. They usually appear during a person’s late teenage years or early 20s. If wisdom teeth come through correctly (meaning they grow straight with no complications), they do not need to be removed. However, this isn’t the case for many patients, as wisdom teeth are often “impacted,” causing a number of problems. 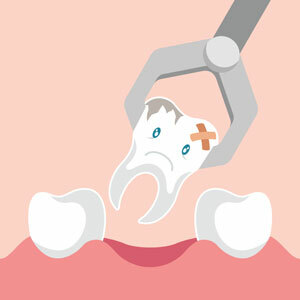 Impacted wisdom teeth occur when those teeth grow into the mouth crooked or sideways. Wisdom teeth can also come through only partially, with the remaining tooth trapped under the gum. Impacted wisdom teeth can cause pain and stiffness, swelling, infection, tooth decay, misalignment, nerve damage, jawbone damage, and cysts and tumours in the jaw. If you are having problems with your wisdom teeth, Dr Henry will provide a thorough examination, and discuss whether removal is your best option. Contact Red Hill Dental today to get started.